The Daily Sequin: Happy Holi!!!! Its Holi here in India.. A festival of colors. There is a riotous celebration with people starting out dressed in white and ending the day absolutely multicolored. Keeping in spirit with this beautiful festival, I present to you a riot of colour. First off is this very pretty pink top from Antik Batik. The scrumptious water melon coloured top is made of a light silk-chiffon which is perfect for summer. 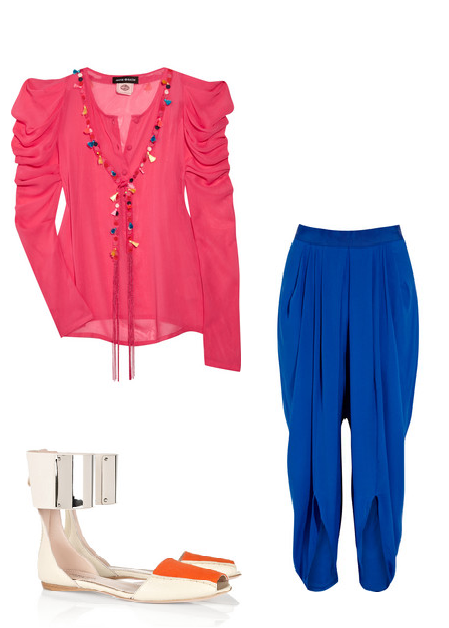 The top includes a cute multicoloured tasseled tie with puffed long sleeves which is so very playful. Pair it with these very comfortable and very chic harem pants in a bright blue silk-crepe. A playful summer look with an Indian spin on it. To complete the look and take it to the next level, go for these gorgeous flat sandals from Giambattissta Valli. They are made of cream leather and orange twill with silver metallic ankle cuffs. Take inspiration and have fun with colour this summer.For a simpler look, you can pair any of these looks with white/neutrals. There is a Spring in my step..
A salute to the Japan..